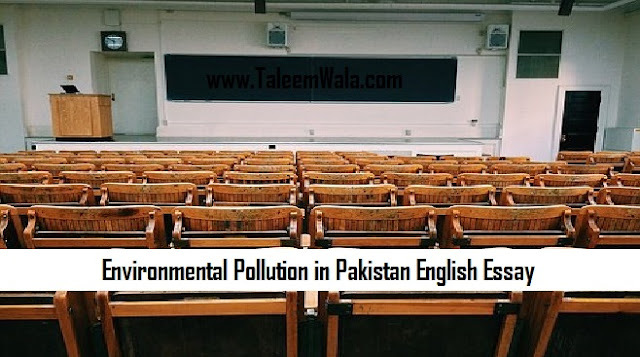 Here's a note of Environmental Pollution in Pakistan English Essay for BA, MA Classes for Pakistani students to understand the easy wording of the English essays and know the topic for easily writing their paper. So read and download this Environmental Pollution in Pakistan English Essay for BA, MA Classes and impress your teachers. Excessive presence of impurities in the breathing atmosphere is called Pollution. Clear air is an essential part of health. Presence of Oxygen in the air Up to standard quantity completes the process of oxidation in the lungs while we inhale. This oxidation is the main source of energy in the body and is chemical reaction in nature. The reduction of quantity of oxygen creates pollution. Pollution is a social problem of Pakistan because. due to expansion of industry, urban population is seriously involved in pollution. The standard of health specially in urban areas is falling down due to this event. Expansion of industry, transportation and pressure of population expansion in urban areas has given birth to pollution. Clear air is as necessary for health as clear water and pure food are. Urban population is growing rapidly mostly due to migration of Population from rural areas. Industrial cities are attracting people for employment, studies and facilities of modern life. Slums have developed in dark and dingy streets where ill-health and high crime rate has been found besides pollution. The increasing number of automobiles on roads, making noise and leaving smoke behind; and the dust and smoke of industries have fully contributed to pollution. We can easily judge the number of automobiles increasing rapidly from the number plates of motor vehicles running on roads. Some cities have finished their category of series from. A to Z and now entered in complex classification as shown on bank notes. To reduce pollution, we cannot decrease the pace of industrial progress in man. We will have to adopt measures to neutralize the unwanted effects of pollution. Such measures consist upon growing natural forestry, plants, grass and greenery. Such measures count upon living in open houses and avoiding congested living areas. Smoke and dust are the major ingredients of pollution which can be controlled by living in rural and sparsely populated areas. All the people of. urban areas cannot leave city life which itself has important function of urbanization and industrialization. Smoke releasing vehicles can be easily banned to run on roads. Open space can be covered by growth of plants. Use of gas for burning and heating purposes has also added into this problem of pollution. Simultaneously, the growth of plants and greenery can reduce the intensity of the problem. Pollution has led to diseases of throat and chest, T.B., and some types of cancer. The ratio of Red Blood Cells (R.B.C.) in human blood falls down from its normal, leading to anaemia, which ultimately leads to jaundice and the functioning of liver is badly affected. Pollution is a social problem because it can be reduced and controlled by collective efforts of the people. In rural areas, agriculture has become itself an industry. The use of chemical fertilizers and pesticides has converted the natural system into mechanized farming. The spray of pesticides on crops devastates the natural environment and the smell of the medicines converts the clean air into pollution. The people of rural areas are also being affected by this problem. If you need read more English essays and want to be a bright student of English in Pakistan then stay connected with us and we will update you with more essays.